Each player on a team's roster is provided with a shirt or jersey by default. Any player you "invite" is on the roster unless you remove him or her, and will receive a shirt. Do not invite anyone unless you are certain they are playing on your team. A player does not need to accept an invitation to be considered "on the roster" or get a shirt. If you pay for extra shirts, make sure the number of players on your roster matches the total number of shirts you want, as you will not receive more shirts than players listed on your roster unless you note in the comments which extra sizes you want. Similarly, if you have fewer players on your roster than the default shirt quantity, you will still only receive the number of shirts for players listed on your roster, unless you note somewhere which other sizes you want. 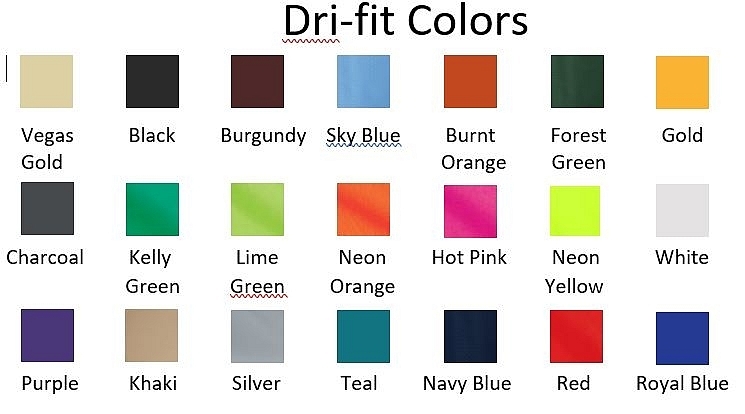 Colors are not guaranteed to look exactly as they appear on this page, since the supplier's color may vary slightly and these are color swatches copied from the manufacurer website. Basketball is the only sport that has numbers on jerseys, and other sport shirts are not able to be numbered. Please do not pay attention to any language on the website about shirt size change deadlines, shirt cutoff deadlines, or anything else. Some leagues that use this same software use this for certain purposes. We do not. Captains will be e-mailed with dates by which they need to have rosters set on the website for the purposes of ordering shirts. Returning teams may use shirts or jerseys from previous seasons. They must be shirts from the same sport, as all our sports have a different graphic on the shirt. The captain must request this in the comments section during registration, or be subject to the Default Shirt Order listed below. If you only need a few new shirts, you must specify which sizes or you will receive an entire batch of new shirts. You will receive a credit for every shirt or jersey you don't order. For example, if you only need three new football shirts, you will be credited for the seven you don't order. If you request to use shirts from previous seasons and then do not wear them, MSSC will order shirts for your team and charge you for them. These are 100% cotton shirts that your team will receive if you do not request Dri-fit shirts. 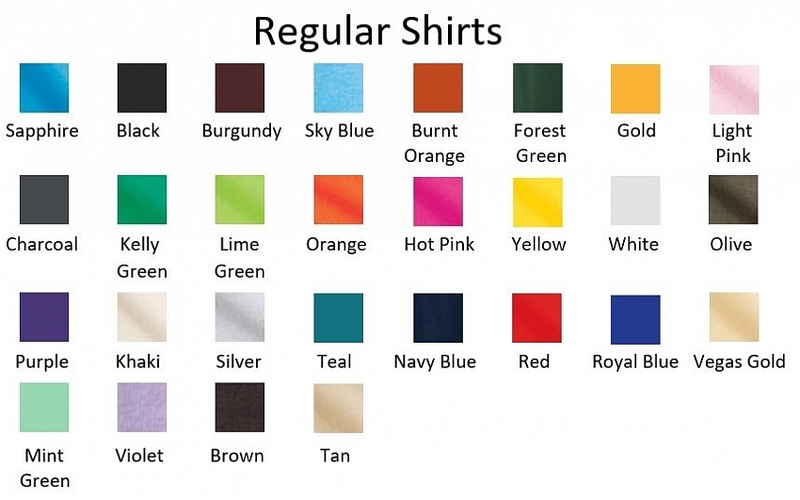 "Small" is the smallest size available for cotton shirts. Please see the color grid above for available choices. Dri-fit shirts are 100% polyester and are lighter, more breathable, and more flexible than the standard shirt. If you select these for your team, you will be charged an extra $3.69 per shirt. PLEASE NOTE: These shirts tend to run larger than the regular cotton shirts and do not shrink much, if at all. Some females think the "Small" dri-fit shirts are still too big, so we also have "Extra Small" as an option. Please see the color grid above for available choices. The additional $3.69 per shirt will be added to your team balance when we place the shirt order, as we don't know how many shirts some teams need until the order is placed. We recommend not paying your team balance immediately upon or shortly after registration if you order dri-fit shirts, as there will be another charge added later for these shirts. These are reversible mesh. Captains must provide a number and size for every player on the roster during registration, or at least in an e-mail prior to jerseys being ordered, or sizes and numbers will be selected at random for your team. New colors have been added as of Spring 2018. Please see the color grid above for available choices. 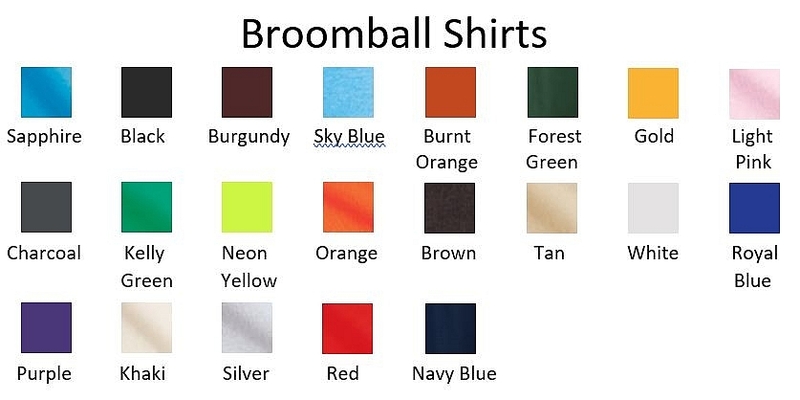 Broomball shirts are long-sleeve, 100% cotton shirts. See the color grid above for available choices. Basketball: 10. Jerseys will be numbered 1 - 10 if you do not specify numbers. Teams who already have shirts or jerseys from a prior season may reuse them and request a credit for any shirts they do not order. The credit is the actual cost of a shirt ($4.22 for cotton t-shirt and $10.55 for a basketball jersey at the time of this posting and subject to change). Extra shirts are $9 each for standard cotton t-shirts. Long sleeve shirts are $12 each and basketball jerseys are $18 each (also subject to change). The extra cost covers many things: the possibility that a team wins the championship and would need extra champs shirts, the cost of iron-on numbers for basketball jerseys, as well as administrative time needed to manually update several things on the back end. If you have any questions about our shirt policies, please send an e-mail to patrick@madisonssc.com.